What we study in hydrology? In hydrology we study Hydrologic cycle, its processes, water balance, precipitation types, estimation of precipitation, and analysis of precipitation data. We also study infiltration phenomena, solution of the Richard’s equation and approximate infiltration models. 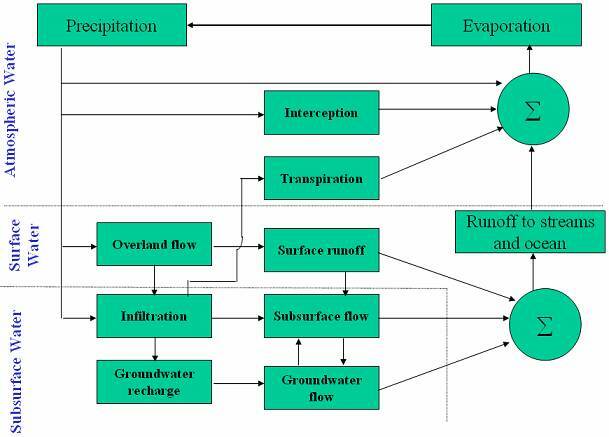 Methods of measurement of stream flow, stage discharge relation, unit hydro graph theory, Transposition of Hydrograph, Synthesis of hydrograph from basin characteristics, stream flow routing, flood frequency analysis and attenuation of flood flows are also studied in Hydrology. 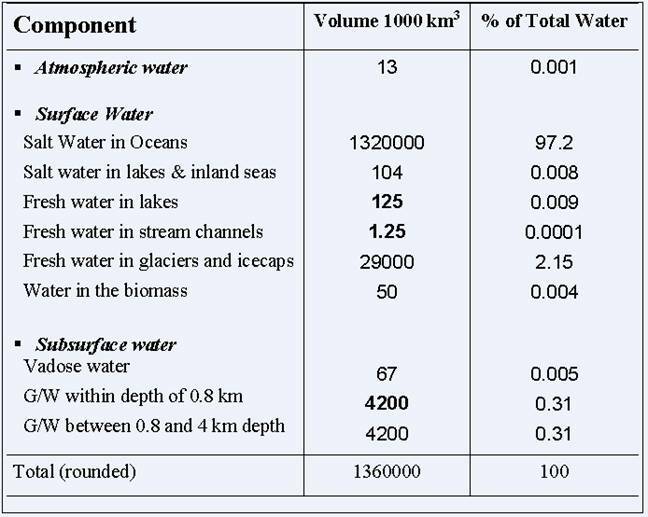 The study of water in all its forms (rain, snow and water on the earth’s surface), and from its origins to all its destinations on the earth is called hydrology. Water is one the most valuable natural resources essential for human and animal life, industry and agriculture. It is also used for Power generation, navigation and fisheries. Tremendous importance is given to the hydrology all over the world in the development and management of water resources for irrigation, water supply, flood control, water-logging and salinity control, Hydro power and navigation. It uses hydrologic principles in the solution of engineering problems arising from human exploitation of water resources of the earth. The engineering hydrologist, or water resources engineer, is involved in the planning, analysis, design, construction and operation of projects for the control, utilization and management of water resources. Hydro logic calculations are estimates because mostly the empirical and approximate methods are used to describe various hydrological processes. Hydrology is used to find out maximum probable flood at proposed sites e.g.. Dams. The variation of water production from catchments can be calculated and described by hydrology. The expected flood flows over a spillway, at a highway Culvert, or in an urban storm drainage system can be known by this very subject. It helps us to know the required reservoir capacity to assure adequate water for irrigation or municipal water supply in droughts condition. The hydrologic cycle describes the continuous re-circulating transport of the waters of the earth, linking atmosphere, land and oceans. Water evaporates from the ocean surface, driven by energy from the Sun, and joins the atmosphere, moving inland as clouds. Once inland, atmospheric conditions act to condense and precipitate water onto the land surface, where, driven by gravitational forces, it returns to the ocean through river and streams. The process is quite complex, containing many sub-cycles. Engineering Hydrology takes a quantitative view of the hydrologic cycle. The quantification of the hydrologic cycle which is an open system can be represented by a mass balance equation, where inputs minus outputs are equal to the change in storage. Import defined as water channeled into a given area. Groundwater inflow from adjoining areas. Export defined as water channeled out of the same area. A Catchment is a portion of the earth’s surface that collects runoff and concentrates it at its furthest downstream point, referred to as the catchment outlet. The runoff concentrated by a catchment flows either into a larger catchment or into the ocean. The place where a stream enters a larger stream or body of water is referred to as the mouth. The terms watershed and basin are commonly used to refer to catchments. Generally, watershed is used to describe a small catchment (stream watershed), whereas basin is reserved for large catchments (river basins). The watershed or basin is defined by the surrounding topography, the perimeter of which is called a divide. It is the highest elevation surrounding the watershed. All of the water that falls on the inside of the divided has the potential to be shed into the streams of the basin encompassed by the divide. Water falling outside of the divide is shed to another basin. 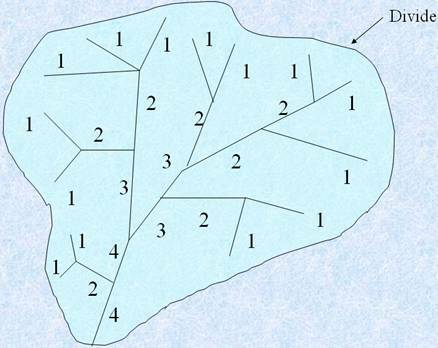 Horton suggested a classification of stream order as a measure of the amount of branching within a basin. A first order stream is a small, un-branched tributary. A second order stream has only first order tributaries. A third order stream has only first and second order tributaries and so on. When a channel of lower order joins a channel of higher order, the channel downstream retains the higher of the two orders. In a given year, a catchment with an area of 2500 km2 received 1.3 m of precipitation. The average rate of flow measured in a river draining the catchment was 30 m3s-1. How much total river runoff occurred in the year (in m3)? What is the runoff coefficient? How much water is lost due to the combined effects of evaporation, transpiration, and infiltration? (Expressed in m). Water falling in solid or liquid form e.g.. rain, snow, and hail. Three mechanisms are needed for formation of precipitation. 1. Lifting and Cooling - Lifting of air mass to higher altitudes causes cooling of air. 2. Condensation - conversion of water vapor into liquid droplets. 3. Droplet Formation - Growth of droplets is required if the liquid water present in a cloud is to reach ground against the lifting mechanism of air. Cyclonic precipitation is caused by lifting of an air mass due to the pressure difference. Cyclonic precipitation may be either frontal or non-frontal cyclonic precipitation. It results from the lifting of warm and moist air on one side of a frontal surface over colder, denser air on the other side. A front may be warm front or cold front depending upon whether there is active or passive accent of warm air mass over cold air mass. 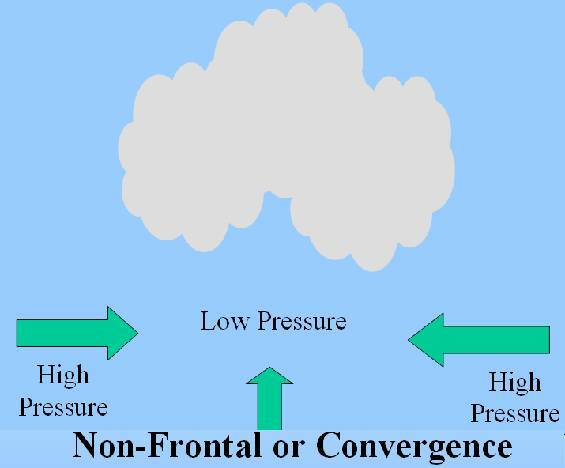 If low pressure occurs in an area (called cyclone), air will flow horizontally from the surrounding area (high pressure), causing the air in the low-pressure area to lift. When the lifted warm-air cools down at higher attitude, non-frontal cyclonic precipitation will occur. In the case of a cold front, a colder, denser air mass lifts the warm, moist air ahead of it. As the air rises, it cools and its moisture condenses to produce clouds and precipitation. Due to the steep slope of a cold front, forceful rising motion is often produced, leading to the development of showers and occasionally severe thunderstorms. In the case of a warm front, the warm, less dense air rises up and over the colder air ahead of the front. Again, the air cools as it rises and its moisture condenses to produce clouds and precipitation. Warm fronts have a gentler slope and generally move more slowly than cold fronts, so the rising motion along warm fronts is much more gradual. Precipitation that develops in advance of a surface warm front is typically steady and more widespread than precipitation associated with a cold front. Warm front precipitation is generally light to moderate. Convective precipitation is caused by natural rising of warmer, lighter air in colder, denser surroundings. Generally, this kind of precipitation occurs in tropics, where on a hot day, the ground surface gets heated unequally, causing the warmer air to lift up as the colder air comes to take its place. The vertical air currents develop tremendous velocities. Convective precipitation occurs in the form of showers of high intensity and short duration. Orographic precipitation is caused by air masses which strike some natural topographic barriers like mountains, and cannot move forward and hence rise up, causing condensation and precipitation. All the precipitation we have in Himalayan region is because of this nature. It is rich in moisture because of their long travel over oceans. Time distribution: Rainfall hyetographs are plots of rainfall depth or intensity as a function of time. Cumulative rainfall hyetographs are also called rainfall mass curve. Isohyets (contours of constant rainfall) can be drawn to develop isohyetal maps of rainfall depth. They are known as non-recording because they do not record the rain but collect the rain.